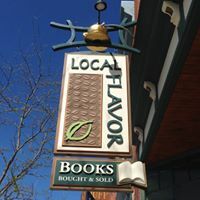 Local Flavor is a Boyne City bookstore, coffee shop and internet cafe with a hometown feel. The store includes a large selection of books, many of which are good quality used books. Store owner, Chris Bandy offers customers a trade-in program where used books can be exchanged for a house credit! You’ll also find a large selection of Michigan-themed books. The store hosts a number of book signing and reading events.